French is to fine dining what Italian is to opera or Russian is to ballet. They are superlative adjectives, the acme of the art. After all, wasn’t the modern restaurant born when revolutionaries of no fixed abode flocked to Paris and the best chefs in the world, those of freshly decapitated aristocrats, found themselves unemployed? Actually this is just a popular myth invented by the Goncourt brothers. Restaurant comes from the French word for a restorative medicinal bouillon. Hence, “restaurateur”, a person with skill to do this (and not ‘restauranteur’). Places serving these tonics were common before the revolution and catered to the fashionably delicate. The revolutionaries however promoted working-class eateries for fraternal feasts and communal square meals. They spurned the former chefs to the aristocrats, executed at least one who had managed to find a job in a revolutionary kitchen, and were suspicious of former royal staff. Nor would they have anything to do with extravagant dishes or such ‘wasteful’ ideas as reductions. Louis XVI was arrested when he stopped to stuff himself at an inn, while attempting to escape. After the Terror however, Parisians began to recover their joie de vivre and the restaurant tradition of the west was born from the innovations of the ascendant new bourgeoisie. Separate tables were introduced; kitchens were sealed off; establishments became gilded and decorated with chandeliers and mirrors; menus were instituted, listing a variety of dishes, often with their provenance. ‘La carte’ means both ‘menu’ and ‘map’. From the outset, restaurant criticism (modeled on the drama review) and early guide books to the eateries of Paris played a major role in shaping the institution into its modern form. During the 19th century, restaurants became fashionable places frequented by foreigners, particularly the British and Americans who found Paris remarkably cheap. French chefs were trained through a system of apprenticeship arising from the former guilds. They worked hard at protecting their craft by persuading the rest of the world, particularly the English-speaking nations, that as the inventors of haute cuisine they possessed its secrets. There may be a Starbucks in the Louvre and a MacDonalds on the Champs-Elysées, but the French have been remarkably successful in retaining their pre-eminence. My partner in gastronomy, Munchkin, and I decided to go for a French cookery lesson. 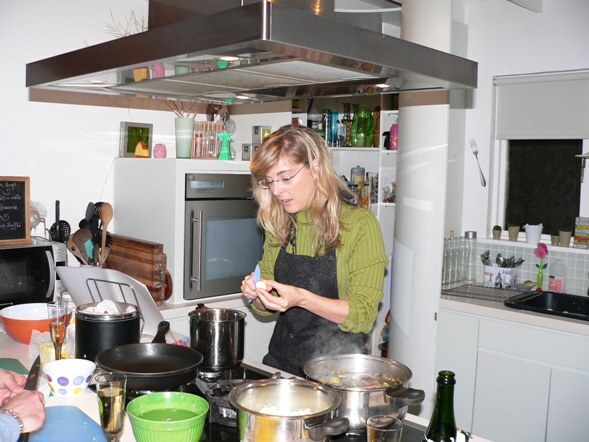 In Cape Town there are numerous cookery schools in various formats. These run from amateur to professional, include demonstration chef’s tables, six-week long curricula covering the bases, day-long explorations of specific ethnic cuisines, ‘fun’ internships in actual restaurants (for which you pay), and even raw food courses where you learn to not to cook food. I particularly liked the sound of one run by Nadège Lepoittevin-Dassé. She promises to help one reach the “fabled status” of Frenchiness. Here you book as a private party with up to six friends. You agree beforehand on a menu. You cook and eat the meal at her home in Fish Hoek overlooking the ocean. Nadège says from the bedroom you can sometimes actually hear the whales when they come into the bay to breed. We arrive with wine, our aprons and sharp knives, as instructed. Nadège, always neat, precise and professional, has recipes printed out, the menu chalked on a blackboard in her elegant hand, and work stations set at the domestic kitchen counter. Chanson and French pop play in the background. Nadège, who is taking a respite from the financial world to pursue her passions, has been in South Africa for ten years and her enthusiasm for the country is infectious. This September she will also be running an impressive-looking culinary tour of her home province Normandy. We start with onions and tips on how to slice them up with the minimum of tears. But the secret to French onion soup lies in the stock already prepared by Nadège about which she briefs us. Nadège says this dish is a favourite at midnight on New Year. Her class is open to skilled and unskilled chefs. She doesn’t blink an eye when I drop an egg on the floor or when Munchkin pours the yolk and milk meant to baste the puff pastry for our fillet en croûte into the blender with the chicken liver paste for coating the beef. I however blink when she adds a good measure of very fine Cognac; no cheap substitutes in this kitchen. Next up is the reason I’m here – to perfect sauce Béarnaise. Nadège inducts us into getting the sabayon base frothy and airy and stable enough. I then discover what I have been doing wrong all these years. Of course, I can’t give any secrets away here. For dessert we fold a lemon soufflé. When we remove it from the oven Nadége shushes us; if it has turned out a success the slightest noise will make it collapse, she jokes. It has been an enchanting evening and we still get to eat the delicious fruits of what has been a near effortless labour. Contact Nadège at: http://www.nadegecuisine.com/Contact.html for cooking classes. The tour to Normandy is from September 5 to 12. This appeared in the Mail & Guardian on 1 July 2011.